“Un bel castillo al cabo alto de la tierra, fuerte y de buena habitacion”. D.A. Sabatino, the royal archivist, thus describes it in the “Apprezzo della Terra di Parabita” in 1678. It was constructed in the late Middle Ages, and over time it has been restructured and restored so that little is left of its Angevin origins. In the first years of the sixteenth century, the feudal lord of Parabita, Francesco del Balzo, the Count of Ugento, lodged the French troops of Francis I, who were fighting the Spaniards of Emperor Charles V based in Gallipoli. In an historic battle in 1528, the Gallipoli soldiers led by Pirro Castriota defeated the French issuing from the Castle of Parabita. Due to this victory, Pirro Castriota became the feudal lord of Parabita. It is almost certain that the Copertino architect, Evangelisto Menga, was commissioned by Pirro, in the period 1540 – 1545, and began to modify the castle, re-proposing it more as a residence than as a fortified bulwark. He contributed to reinforcing it by replacing the great old circular towers with new, so-called “modern” bladed bastions. We owe the present solution to the architects Avena of Naples and Napoleone Pagliarulo of Parabita, who in 1911, commissioned by the then owner Raffaele Elia, definitively modified the majestic manor by making it more aesthetically pleasing and decorating it with interesting frescoes in the Neo-Gothic style. The body of San Vincenzo Martire (St. Vincent the Martyr) was preserved in the chapel: it came from the catacombs of Commodilla in Rome, and was given to the Duke of Parabita Giuseppe Ferrari in 1737. It was transported to the main church in 1855 according to the wish of the last Duchess of Parabita, Lucia la Greca. 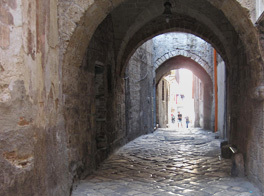 An intriguing story goes back to 1780 when, in the rooms of the castle, a love story began between don Francesco Saverio, the son of don Giuseppe Ferrari, the first Duke of Parabita, and Rosaria Cataldo, a young peasant girl. The story, which was discovered and later published by Mario Cala in 1977, presents some similarities to Manzoni’s novel “I promessi sposi” (The betrothed), but did not have a happy ending. 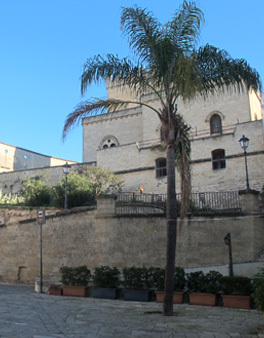 The attempted marriage was never declared legitimate: a decree sanctioned the confinement of Rosaria to the nunnery “Conservatorio delle Pentite” in Lecce and prohibited don Saverio from acceding to it. His grief was such that he died a year later. Today the castle is owned by the Villani and Ravenna families, the descendants of the Elias, to whom the Parabita feudal possessions have come down from Mariantonia, the daughter of Duchess Lucia la Greca. In recent years, a hereditary dispute which occupied the two families for more than 50 years has been resolved. The new arrangement has aroused hopes once more that the building with its dimensions, its high position and its attractive architecture can become an opportunity for investment and re-launching, with interesting implications in appeal and development for the whole town.